Disclosure: This blog post is sponsored by Sam’s Club. All opinions are mine. My husband and I have made a commitment this year to really focus more on better health & wellness for our whole family. We are definitely still a work in progress, but we have really been working hard to create healthier habits for ourselves as well as our two girls. We’re now in February and still going strong on our goals for healthy living, so I wanted to share with you some of the simple but effective habits we are changing in our lives towards better health. These habits may be things you already know, but if you lead a busy life like I do, hopefully these ideas will resonate with you on easy & effective ways you can incorporate them into your own life & busy schedule. While we are focusing on better health, it is important to us that we also stay on budget to meet our financial goals for this year, so we look for ways we can save while still eating healthier & creating healthier habits. Warehouse stores are so popular right now because of the convenience of shopping in bulk to save time & less trips to the store, but also because you’ll find bigger savings by shopping in bulk. Shopping in bulk often involves a big trip to the store to stock up, though, & I am all about online shopping these days to be able to stay home & order from the comfort of my home. This helps me to keep more balance in my life and have more time to focus on my health & wellness, as well as my family’s health. Life is so busy that it’s hard to make time for a big trip to the store some weeks, so I love the convenience of ordering from home, especially taking advantage of the bulk products I love from the warehouse stores. I joined Sam’s Club a few months ago as a member & have had the opportunity to try out their online shopping several times. There are some great savings you will find with a Sam’s Club membership. Whether you are shopping in store or online at SamsClub.com, you will find that the savings will add up big & more than pay for your membership. Even if you don’t have a Sam’s Club store near you, paying for a Sam’s Club membership will get you Plus, I’ve found so many great health, fitness and nutrition items, as well as bulk foods, to help us save while building better health habits. Sam’s Club offers 2 levels of membership – the regular membership & the Plus membership. One of the main differences in the membership levels is that the Plus membership offers FREE shipping on most items with NO minimum purchase required. There are some rare exclusions, but I’ve found that most items do qualify for this free shipping. I think this is where you can really save big by having a Sam’s Club Plus membership & the membership can pay for itself. 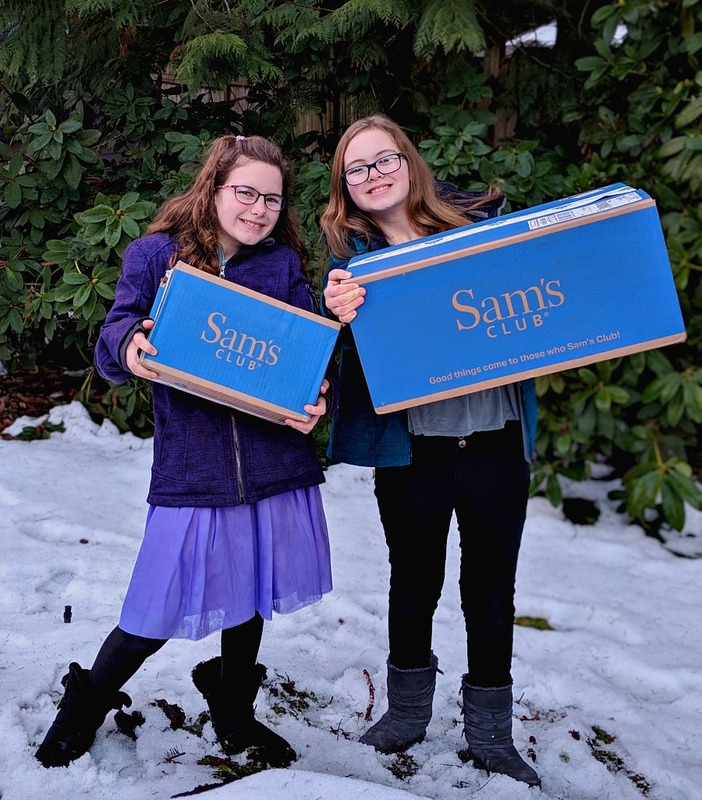 Even if you don’t have a Sam’s Club retail store near you, with the Plus membership, it is just like having online delivery from a local warehouse store of all of your favorite bulk grocery/grocery/health/beauty items. But, you’ll find more savings from Sam’s Club compared to other warehouse & grocery store online deliveries. Prices are the same in store & online – with online grocery delivery, you will often see prices marked higher online compared to in-store, but this is not the case with Sam’s Club as prices will be the same in-store & online for the bulk items & other products, too. Here are more ways that we save while using these 5 tips to improve our health & stay on budget! I will be honest and tell you that I am not the best at eating fruit & veggies during the year – I love to eat them during the summer, but find I don’t get enough of them the rest of the year. I do love to eat all kinds of fruit & most veggies, just struggle with eating them regularly. The biggest roadblock for me was the time it would take to prepare the fruit & veggies when I was running out the door & needed snacks for my busy day of school pickups, work, and after-school activities. I would just look for something fast & easy, but not necessarily the healthiest. Prepping my veggies & fruit ahead of time, chopping, slicing or peeling them, whether it be on a Sunday evening before the week begins or when I have a few moments in the evenings before bed, has made a huge difference for me in eating healthier snacks on a daily basis. It’s so much easier to start your week off with a fridge full of fruit & veggies all chopped and ready to bring with you on the go. One of the best ways to keep those fruit & veggies fresh is to use glass containers for storage during the week in your fridge. I am pretty picky when it comes to freshness with fruit & veggies, so glass containers are definitely the way to go. 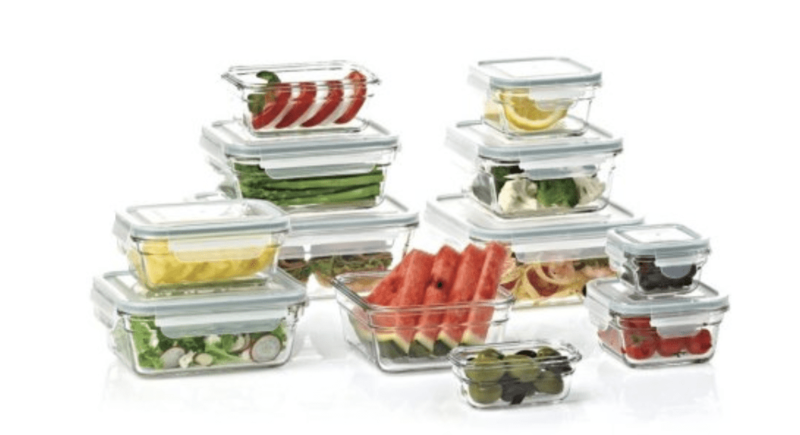 I love the Member’s Mark 24 Piece Glass Food Storage Set from Sam’s Club.com as it’s the perfect size for all the various cut produce that I would use. Plus, they are airtight, leakproof & BPA free, to0, to keep your produce as fresh as possible. Sam’s Club offered them as a “Shocking Value” for just $20.94, so it was about half the price of sets I found at other locations online. Love those Shocking Values offers at Sam’s Club. These are special deal prices that are below the already-low warehouse prices and only available for a short time (some may be as short as 2-3 days and others may last a week. Some of the prices are as low as what we will see all year for that product, so definitely always check those Shocking Values offers at Sam’s Club for health & nutrition products. My husband and I have been using the My Fitness Pal app since beginning of January to aid us in tracking our food better to help us eat smaller portions and healthier food items. A big benefit to using a food tracker system is that it really forces you to keep track of every single bite you eat all day & know the exact amount that you are eating, as I’ve found those little handfuls of snacks here & there can really add up. So, we’ve been on the hunt for low calorie & healthy snacks to keep on hand, while keeping the cost down, so we always try to buy snacks & foods in bulk at warehouse stores like Sam’s Club. We then package the snacks into ziploc bags and measure out each bag, so we know exactly how much is going into each bag to keep track of how much we’re eating. It also makes for quick grab & go snacks when we’re headed out for activities, work, and more. We have our girls package all of the snacks up as they can sit & do this easily with bowls, measuring cups & baggies and get a whole bulk container done in a short time. We love to eat nuts as they are such a healthy option that will keep your full longer. Not only are they filled with protein to fill you up, but they are also packed with fiber, vitamins & minerals, so we always try to keep a variety of nuts on hand. I love the variety of different bulk nuts that Sam’s Club offers from their Member’s Mark brand. 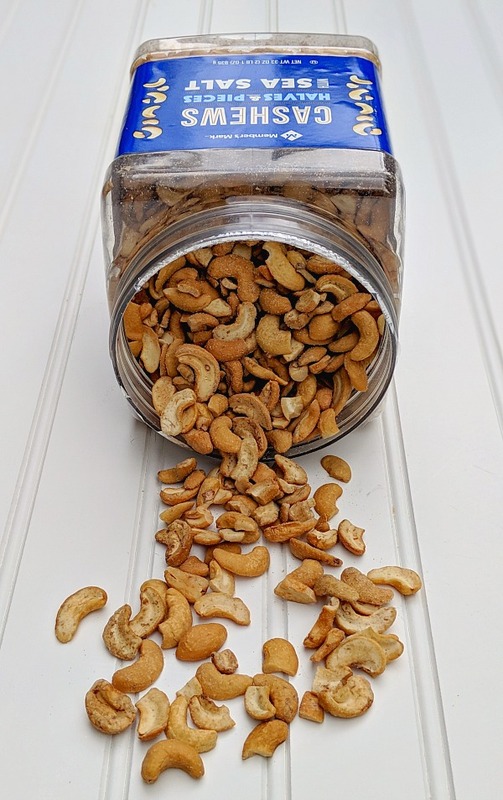 We bought this bulk container of Member’s Mark cashew nuts from Sam’s Club to keep a supply of healthy protein snacks in our pantry & in our car for on the go healthy snacks. Another healthy option to buy in bulk are protein bars. We love to go on outdoor adventures like hiking and snowshoeing, so it’s important that we keep healthy snacks that will give us energy on these outings. 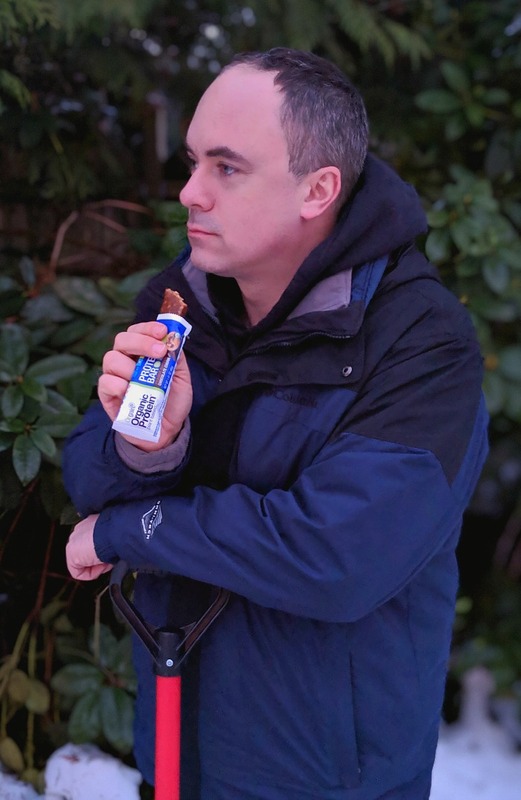 Protein bars are a great source of energy to keep in our backpacks as they are lightweight & we can store them in our backpack to have whenever we need them. Also, a healthy snack anytime, especially after working out in the yard clearing snow after our massive snowstorm. 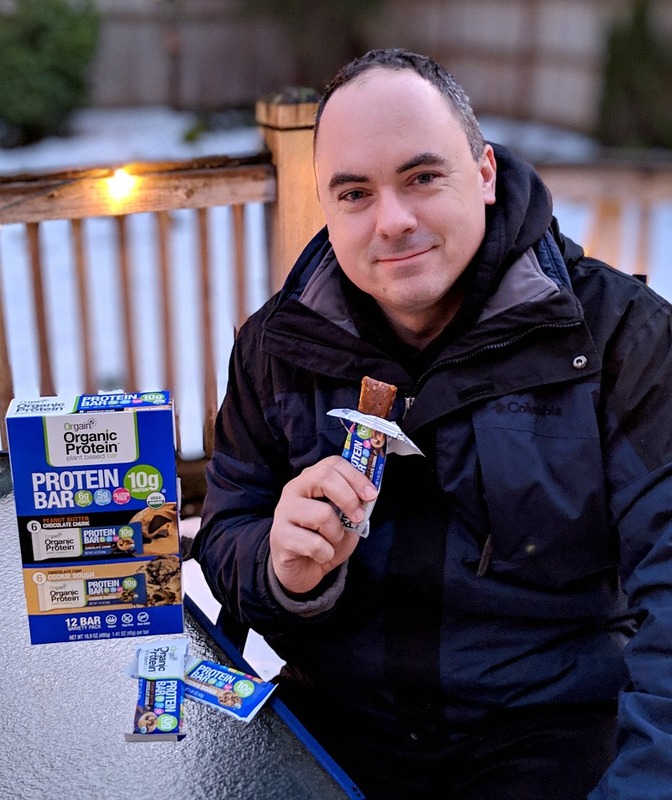 Sam’s Club has organic plant-based protein bars in bulk, which are a great option for us to purchase & use for any outdoor activities or after workouts. Peanut butter is always an item we buy in bulk, too, as we go thru so much peanut butter in our home. 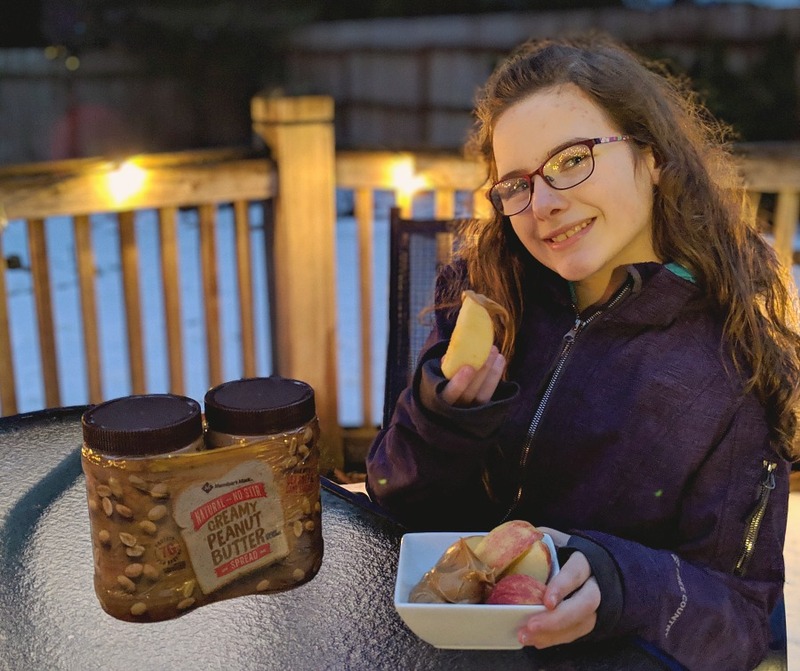 We all love apples & peanut butter for a snack & I’ll pre-pack the peanut butter into small containers so we can bring apple slices with peanut butter for lunches or on the go snacks. I love the Sam’s Club Member’s Mark peanut butter as you can’t beat the price for natural, no stir creamy peanut butter in bulk. One of our important health goals for 2019 is to work on increasing our water intake. We realized that our girls are not drinking enough water throughout the day as they are always so thirsty by nighttime. Water intake is so important for your health in so many ways – prevention & treatment of headaches, give you energy for workouts, better brain function, important for the digestive system to work properly, just to name a few. So, we are coming up with some fun incentives to encourage our kids to drink more water. For every full water bottle they finish, they can earn points towards rewards like electronic time, reading time, etc. We also try to model this by always having a water bottle near all of us & bringing reusable water bottles with us on every excursion, no matter where we go. Now the key in getting them to drink more water, though, is to assure that the water stays cold throughout the day. They are quite picky, like me, about having cold water to drink, so we always look for the best water bottles that will keep water cold the longest. One of my personal favorite water bottles is the S’well Stainless Steel water bottle. I used this in Florida during extreme heat in the summer & it still kept my water cold all day long. I was so excited to find this water bottle on SamsClub.com at a lower price than you’d pay regularly for this bottle. As a busy, work-at-home mom with kids’ activities most evenings, I have been finding it very difficult to find time for me & improving my health, especially in the area of exercise. This is still an area I have a long ways to go towards, but I have found that I need to get creative when it comes to exercise & movement every day. In order to motivate myself to workout & exercise more, I needed new workout clothes that are comfortable & fit well. Sam’s Club is a great option as they frequently have discounts on activewear, both in stores & online – everything from sports’ bras to workout pants to base layers for outdoor adventures. 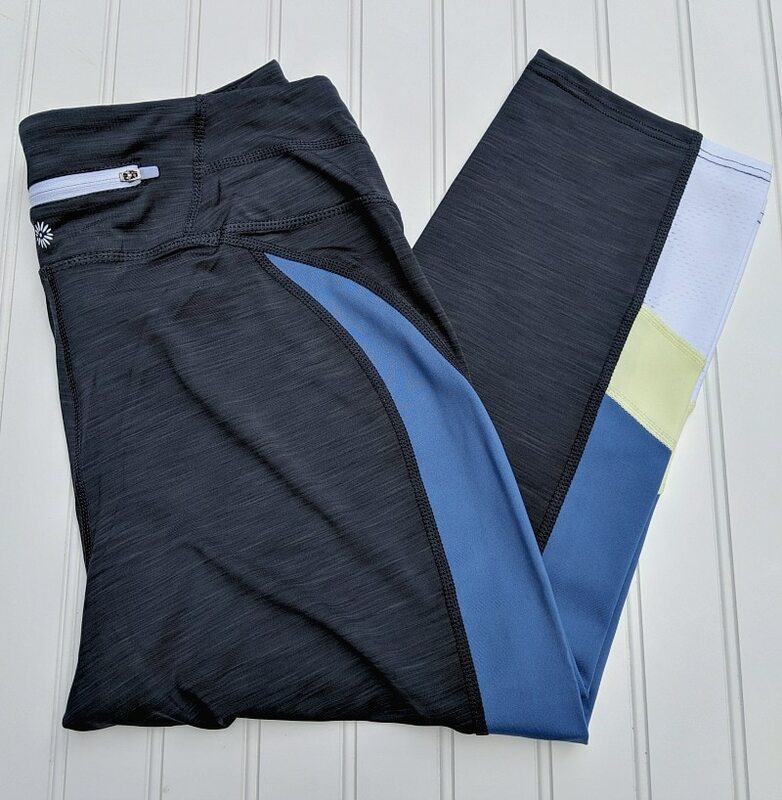 Loved these Women’s Color Block Active Capris I purchased as they are so comfortable & the fit works well, especially with a wide waistband so that it won’t slip or roll as you are working out. Plus, there’s a back zippered pocket for keys. Whenever we can pair a workout with an adventure in the outdoors, this is always the exercise of choice for my family. Being distracted by the beauty of the nature around you is a great way to get in a workout, without having to think about the workout, instead focusing on the unique spots on the trail & the beauty you encounter. We love to hike year-round & snowshoe in the winter, so this is a great way we can all get outdoors & experience new places, while getting in workouts. We have a goal to take a family hike every month this year, whether it be a small adventure in our own town or we head up to the mountains to find longer trails to hike or snowshoe. Our girls love to snowshoe since they can hang out in the snow & often get in some sledding at the end, too. 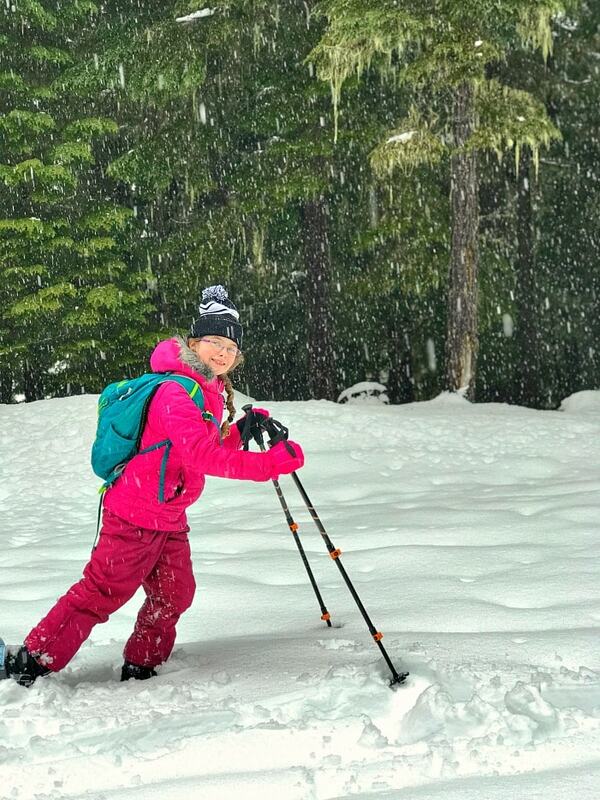 The only issue we run into with snowshoeing is bringing the appropriate amount of layers for the snow, as you still get hot & sweaty when you’re being active even if the temps are chilly. So I have learned it is important to have moisture-wicking base layers to start & then adding multiple layers on top of that, so you can peel them off as needed. Sticking with polyester or wool base layers instead of cotton is key for an active sport like snowshoeing, so you can stay warm enough but also have layers that can breathe for when you are working up a sweat. 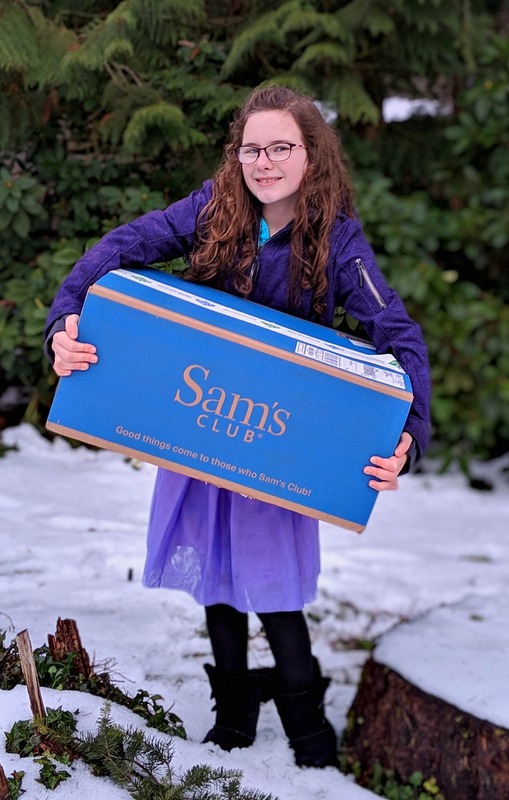 It can be pricey to find outdoor clothing options, so I love to check out places like Sam’s Club for options that will work for me & my family. I found this Ladies Performance Long Sleeve top, made from polyester & spandex & has special moisture wicking technology to keep me warm & dry for my favorite outdoor sport. Another great way to incorporate exercise into time with your family for those of you who lead busy lives is by considering a trampoline purchase. We have been considering this option as it’s a great way to get your kids exercising more on a regular basis and you can use it as a piece of exercise equipment too. Jumping on a trampoline is considered to be a moderate to vigorous intensity exercise, similar in exertion as to playing a sport like basketball, running or biking. But, a whole lot more fun & enjoyable especially if you make this a family activity & involve some fun games & competition. 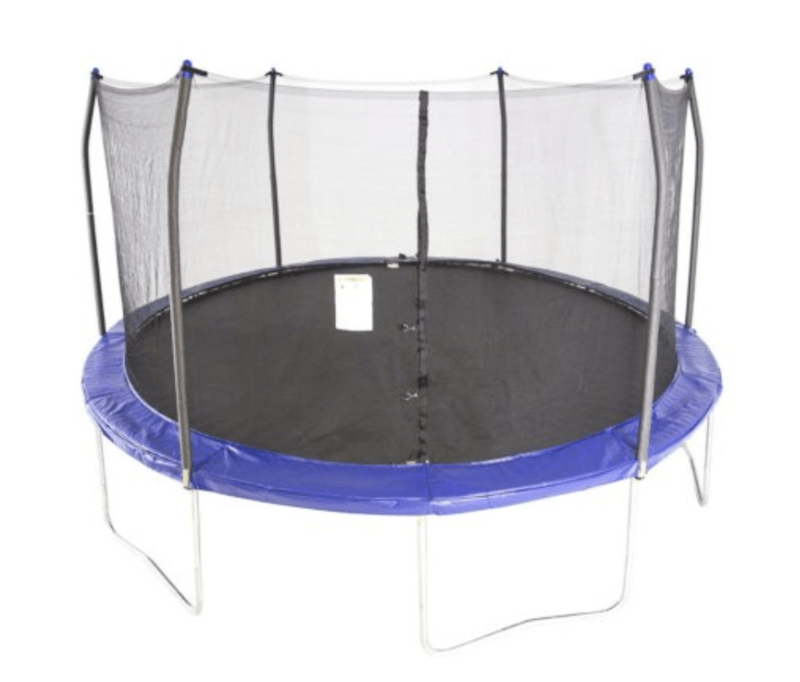 You definitely want to do your research on trampolines as there can be a wide variety of prices, but I have been eyeing the prices on SamsClub.com and they have had some great options for trampolines & I have found them to be some of the best prices I have seen. There have been shocking values & instant savings offers on trampolines, as well as other exercise equipment, too, so always make sure to check out those special savings offers at Sam’s Club. I like to keep the Shocking Values page and Instant Savings page bookmarked and check them frequently as these deals change often & can offer significant savings on popular items. You can even sign up with your email so you’ll be notified of new deals. This is probably the most important aspect that is key to better health for me – better & more restful sleep! Good, restful sleep is so critical for overall health & wellness and just as important as exercise & healthy eating when you are looking at overall better health. Poor sleep can affect you not only short term with difficulty in attention & focus, but also can cause long-term chronic illnesses & affect your physical & mental health. Quality sleep helps your brain to work properly & have better brain function. It also can help to prevent obesity as you eat less calories when you get better sleep, as sleep helps to regulate the hormones that help you to feel hungry or full. The quality of the sleep you get is as important as the amount of sleep. My husband and I both were having a lot of trouble sleeping & we made the switch to not only new mattresses but also switching to more ergonomic pillows at the suggestion of my chiropractor. 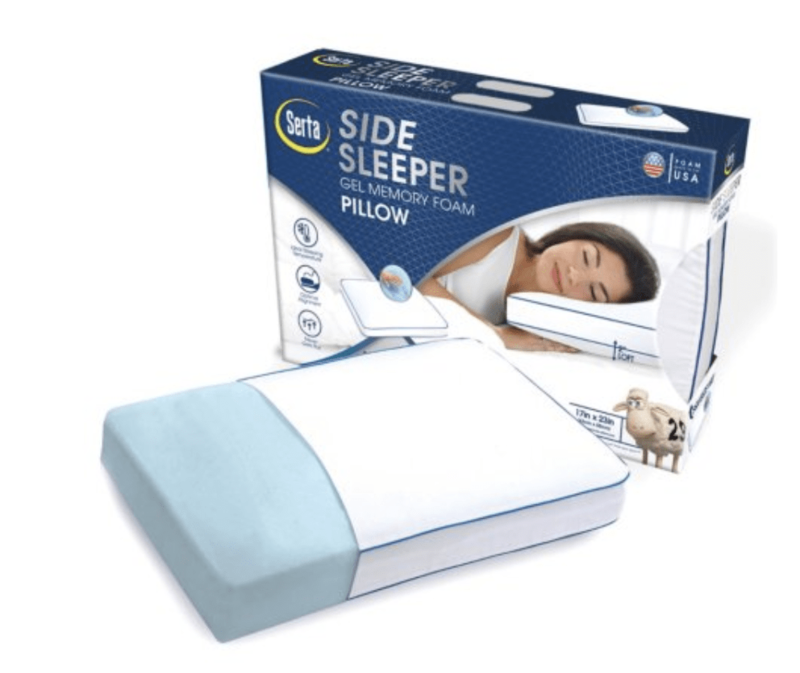 I get headaches & migraines very easily and in the last 6 months or so, we switched to better quality pillows and that has made a huge difference for me, so that I am not waking up with headaches or the start of a migraine. Memory foam pillows are what works for both my husband and I & one of my girl’s recently switched to a memory foam pillow, too. I love that Sam’s Club has a great selection of pillows, including quite a few memory foam pillow options too, like this Serta Side Sleeper Memory Foam pillow. I’ve even found several of them available as Instant Savings offers, too, so the prices can’t be beat. By having the memory foam pillows, these improve the quality of your sleep because your spine is better aligned with your body while you sleep. The memory foam pillows mold to your head, which keeps your neck from moving too much during your sleep & you wake up feeling much more rested & less tension from your head moving more during the night with a regular pillow. Now that I have moved to a memory foam pillow, I definitely notice a difference when I stay in a hotel with regular pillows as I wake up stiffer & more achy & just don’t feel nearly as rested. 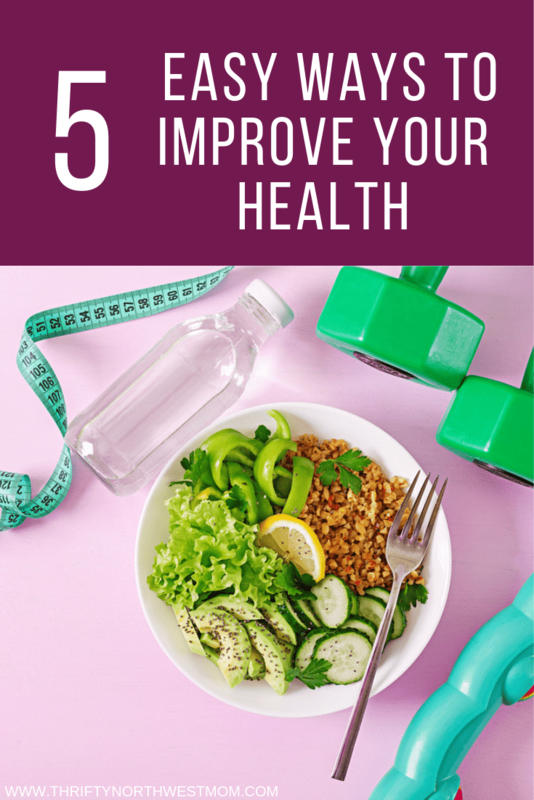 I hope these 5 easy tips for better health encourage & inspire you to think about what small changes you can make towards improving your health & wellness in your life & your family’s life. As you can see, it does not have to be an expensive venture, there are many ways to save & for us, we have found some great products from Sam’s Club.com to help us on our journey of living healthier lives while still staying on our budget to achieve our financial goals as well. A Sam’s Club membership can be well worth it when you take advantage of the many ways to save either in-store or online to work towards achieving better wellness this year.